Zarif’s resignation made headlines around the world within hours of his Instagram post, and regime state-run media outlets rushed to confirm the story. Zarif’s departure is the latest in a series of international crises facing the regime. The re-imposition of sanctions following the U.S. withdrawal from the Iran nuclear deal has further weakened the already struggling Iranian economy, the regime recently failed to meet the terms necessary to retain its membership in the Financial Action Task Force (FATF), and the European Union has taken a series of measures to sanction Ministry of Intelligence and Security (MOIS) agents and expel regime diplomats over the past year because of their involvement in terrorist activities. Zarif has recently come under pressure for his role in the regime’s terrorist plots and meddling in the Middle East. Earlier this month, world leaders from sixty countries gathered in Warsaw to discuss Iran’s role in fostering instability in the Middle East. Days later Zarif lost his temper when asked a series of tough questions while attending the Munich Security Conference in Germany. Zarif, who was clearly rattled by the presence of hundreds of MEK protesters calling for his ejection from the conference, was unable to coherently answer questions about the regime’s terrorist plots on European soil in 2018. Instead, he chose to vilify the MEK: the intended victims of the regime’s plots. Iranians in #Munich tell #MSC2019, Javad #Zarif doesn't represent the ppl of #Iran; he represents a vile & decaying terrorist regime. Zarif continued his off-topic rant with angry words directed at high-ranking U.S. officials. “[U.S. President Donald Trump’s lawyer] Rudy Giuliani spoke yesterday for the MEK. [U.S. National Security Advisor] John Bolton has spoken for the MEK. John Bolton is angry because he promised the MEK that he would celebrate in 2019 in Iran with them. They are still in Paris,” he added. As a member of the regime’s Supreme National Security Council, Zarif plays a key role in all decisions regarding terrorist attacks and assassinations. 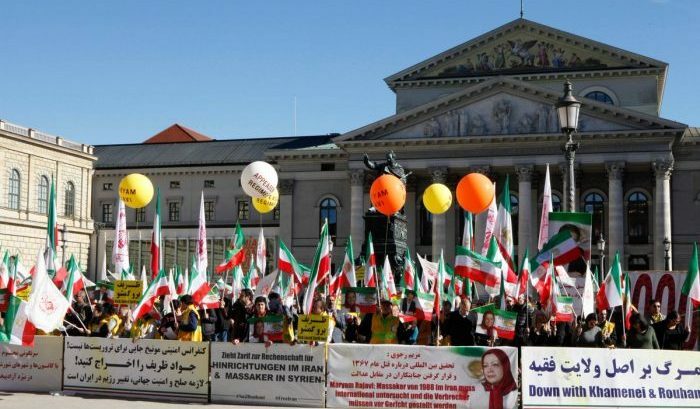 The MEK protesters in Munich urged the international community to expel Zarif because of his terrorist actions and to recognize the right of the Iranian people to rise up and overthrow their oppressors. 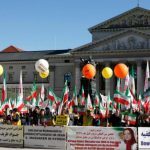 The MEK previously held protests this month in Paris and at the Warsaw Conference. All three protests were attended by hundreds of members of the Iranian diaspora and included well-respected speakers who called for the international community to recognize the right of the Iranian people to overthrow the mullahs’ regime and establish a free Iran. This series of large and well-organized protests across Europe in such a short period of time has left the regime angry and afraid. The mullahs already see the MEK as an existential threat, so the presence of an organized resistance that can follow international conferences around the world has become a thorn in the side of regime leaders. The Munich protesters appear to have caused Zarif to have a total meltdown. The Iranian Resistance grows stronger by the day; the regime grows weaker. Freedom is close at hand.